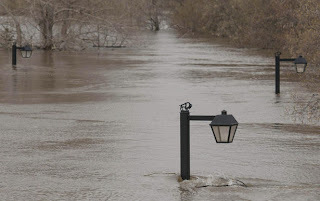 This photo was taken recently in Brandon MB, near the banks of the overflowing Assiniboine River. I heard tonight that the sandbanks surrounding the city are holding back a wall of water that is twelve feet higher than the adjacent roadway. It was a cold winter on the prairies, no question, but not quite enough to produce a post-glacial lake. It has been 13,000 years since Lake Agassiz covered the area; we're in no rush to see its return. The whole situation is rife with superlatives and extreme measures. The biggest flood in over three hundred years, over a thousand roads closed in the province, the planned breach of a dike resulting in the sacrifice of many to save many more. I would not want to be the one making the sorts of decisions that are required to deal with this flood. It's another world around here, two provinces over. For the first time this year, temperatures have breached the 20C mark. I bared my feet and slipped on sandals. And then I crawled out of the winter hibernaculum and raked lawns, swept a winter's worth of grit and spruce needles out of the garage, turned the outdoor tap back on and attached the hose; it's as leaky as it ever was. The patio furniture is now in place, the big patio umbrella awaits the call for summer drinks and shady havens. I can't help but feel a little guilty, and a lot blessed. We've been having torrential rain here (since you left actually). It's nothing like that picture though, and for that I feel incredibly lucky. I keep watching the news with building horror. I can't even imagine what those poor people are going through knowing their homes and farmland are about to be sacrificed in hopes of saving others. So far my brother's place is safe. How about your family and cottage property? Sure hope B is safe from the rising waters. Has it really been raining all that time, Al? That's brutal, it must be getting awfully dreary. I sure lucked out on sunshine whilst there! You could use a little sunshine and warmth right now, Kathy. I'd send some if I could find an envelope large enough. I hope that your brother remains safe and dry, McIlrath Family. My family is all fine at this point, and our cottage is as well, although one of the roads in the area is closed. Allison has been getting rain? We've been getting none here . With the crash of Blogger a couple of days ago, all your comments to this post were lost. All those heartfelt, clever and pithy remarks, lost forever. The return of Lake Agassiz ...or the beginning of the end in 2012? Perhaps the Mayans were right??? If the Mayans were right, we will need to recruit John Cusack to drive us out of the apocalypse, Kathy.